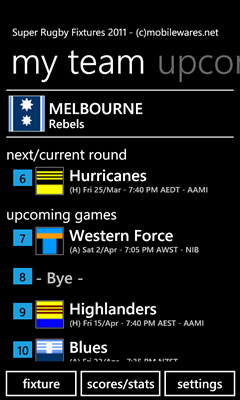 The perfect app for Aussie, South African and Kiwi (SANZAR) Super Rugby Fans! Keep track of the 2011 Super Rugby (Super 15) Season - complete with Round-by-Round and Team Fixtures, latest News (for both the entire competition and your club). 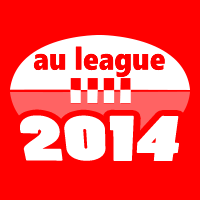 *New* in v1.4 : View live results, ladders, stats, team lists and more. - *NEW* Autoconverts Match times to Your Local Time..
Great app. 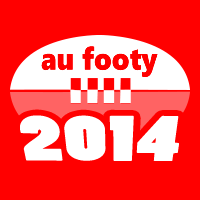 Functionally the same as their AU Footy app. Excellent integration of Bing maps, and great use of the WP7 UI. Can't wait for the season to start. Go Rebels! 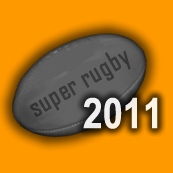 Nb: Above rankings/awards for 'Super Rugby Fixtures 2011' are at time of updating this page.